Open Source Invoice System To Invoice Clients, Track Time & Get Paid! Fulfill your every invoicing need with this leading open source invoice system. 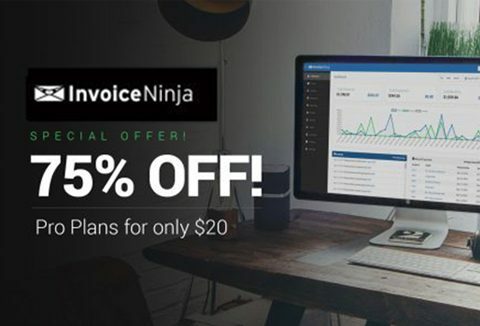 Bringing you Invoice Ninja- a suite of features to invoice, track-time, get paid. Now invoice from anywhere and enjoy less time working & more time living. Buy it at 75% off only on DealFuel. Take A Look At The Demo Of Invoice Ninja - An Open Source Invoice System! What Exactly You Can Do With Invoice Ninja? Invoice Ninja, the open source invoice system is a suite of apps for freelancers & small business to create invoices & proposals, track payments history & expenses, and time billable tasks & projects for clients. Create Invoices in Real-Time: View your invoice come to life in real-time as you add client and project details. Create Tasks, Projects, & Track Time: Do you invoice your clients per hour or minute? Track work time and click to invoice! Customize Invoices with Your Logo: Upload your logo & customize invoice colors to match your brand! 40+ Payment Options Supported: Stripe, PayPal, WePay, Authorize.net, Checkout.com – we support 40+ gateways! Accept Deposits & Partial Payments: Need to collect deposits or partial payments toward future work? Create Recurring & Auto-Bill Invoices: Do you charge clients monthly or annually? Setup recurring invoices & auto-bill clients! Professional Invoice Designs: 4 free invoice templates, Pro members have 10 professional designs! Item & Product Library System: Do you offer products & services again & again? Setup your product library! What Exactly You Will Get In The 1 Year Plan Of Invoice Ninja? This deal includes 1 Year Access Plan. Instant digital redemption on the purchase. Now Create Invoice In A Snap. Send. Get Paid. Hoard Of Features At A Price Of $20 Only!